We want you to not only have a superior sales experience and customer service, but also a superior product. Standing head and shoulders above the rest, Pet Stop brand products are made with the finest materials and cutting-edge technology. In addition, they're backed with the most comprehensive manufacturer's warranty in the pet fence industry. All outdoor transmitters and receivers, in addition to most other Pet Stop products, come with a lifetime warranty. 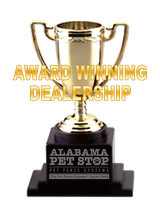 Pet Stop's superior product reliability allows them to offer a warranty unmatched by any other company in the industry. Pet Stop products are carefully Designed, Engineered, and Manufactured in America by people that love their pets just like you do. Pet Stop is one of the last holdouts in an industry that has gone crazy for off-shore manufacturing. Even the original dog fence company, Invisible Fence, is manufactured in China these days. At Pet Stop, we prefer to see our products being built. Maintaining our own Pennsylvania manufacturing facilities, staffed with our own employees here in the USA ensures that the people who make Pet Stop products share the same compassion and understanding that you do. We don’t feel keeping your pet safe and happy at home is a responsibility that can be outsourced to foreign countries. We’ll spend a little more, make products we can be proud of, and have nothing to apologize for later. 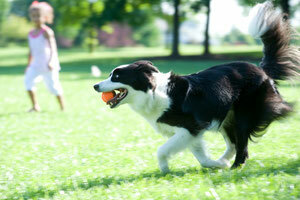 Do you have a small property, and need to maximize your dog's play space? Or maybe it's too tight for your pets to access an important part of your property. With Pet Stop's Edge-To-Edge Boundary Technology, we can allow your pets much closer to the boundary wire, giving them access to areas that normal pet fence systems just can't give. 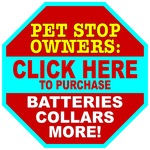 Pet Stop SmartReceiver Collar Batteries are ranked the highest in the industry in both reliability and durability - they're even known for their excellent performance in cold weather. They are also customer friendly - easy to replace, and comparatively less expensive than most competitors' brands. Our indoor and outdoor transmitters and all our receivers are compatible with each other, giving you a full range of pet containment options. Additionally, all Pet Stop products can be programmed for compatibility with many other brands, including Invisible Fence, PetSafe, Dogwatch, and Dog Guard brand wired dog fence products. Not all competitive products are compatible, so Contact us for details or questions.